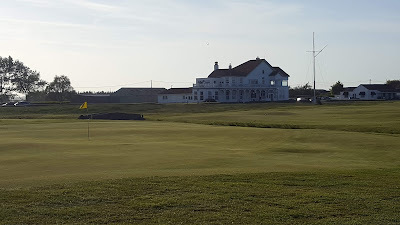 The opening GSGB meeting of the 2018 season was played over two of England's premier link's courses, Prince's on Day 1 and Royal Cinque Ports on Day 2. Prince's currently features at number 57 in the list of England's Top 100 courses with RCP sitting in 13th place, some might say that it should be in the top 10! Sixty eight members battled with northerly 20 mph plus winds on both days as they competed for the honour of being crowned this year's Scratch Cup winner. The Prince's round was played over the Himalayas/Shore combination with the recently re-designed Himalayas loop being particularly challenging in such tough conditions. Both nines are well bunkered but the Himalayas now contains a number of wetland hazards to add to the difficulty. In such tough conditions Nigel Hodges played particularly well to score 34 points in the men's competition with Karena Collier scoring an impressive 33 in the ladies half of the draw. At Dinner we were joined by the Prince's Captain Mr Bill Howie and his wife Sheila. Chairman Robin Moser presented Bill with a £500 donation to be used to support the club's junior section. The wind was still a major factor on Day 2 but at least the sun made the day feel a little warmer. The winners were Mark Lockley with an excellent 34 points and Anne Perry on count back with 29 points. Royal Cinque Ports certainly lived up to its reputation as one of the world's best links courses as it has the best collection of green complexes that I personally have ever seen. The men’s Scratch Cup was won by Tim Russell from Alwoodley with 52 points, who managed to bring an end David Archibald's excellent run of 4 successive victories. Tim overcame a two shot deficit at the half way point to win by one point. The Ladies Scratch Cup was won by another previous winner, Karen Lobb from Northamptonshire County who scored 46 scratch points, beating Denise Parker by 2. Although narrowly losing Scratch Cup, Denise won the aggregate handicap prize with 54 points, Geoff Ogden winning the men's aggregate with 61points. A full list of prize winners can be seen below. You can see a photo album of the prize winners and some stunning shots of RCPGC by clicking here. Trophies presented by Keith James of Royal Cinque Ports and GSGB Chairman, Robin Moser.